The team of LoveYatri: Journey of Love treated the audience with a musical extravaganza celebrating the musical journey of love in Mumbai. It was Producer Salman Khan’s behest to promote the songs of the film, that has now gone ahead to become Chartbusters, with LoveYatri album becoming an instant rage amongst masses. To celebrate the tremendous response to the album comprising of songs for every occasion, be it a Navratri festive song, a club track or a romantic track, Team LoveYatri held a music concert on Wednesday evening. The live concert held in Bandra hailed the album of the year with chartbuster songs in the presence of Producer Salman Khan, Director Abhiraj Minawala, leading duo Aayush Sharma and Warina Hussain along with the singers Darshan Raval, Udit Narayan, Palak Muchhal, Badshah, Asees Kaur, Dev Negi and composers Tanishk Bagchi, DJ Chetas and Lijo. The grand musical event boasted of electrifying performances by not just the singers but also the leading pair as Aayush and Warina matched steps to the tunes of the chartbusters. While Palak Muchhal and Udit Narayan recreated the Garba magic with Dholida, Badshah and Asees Kaur set the house on fire with the club anthem Akh Lad Jaave. 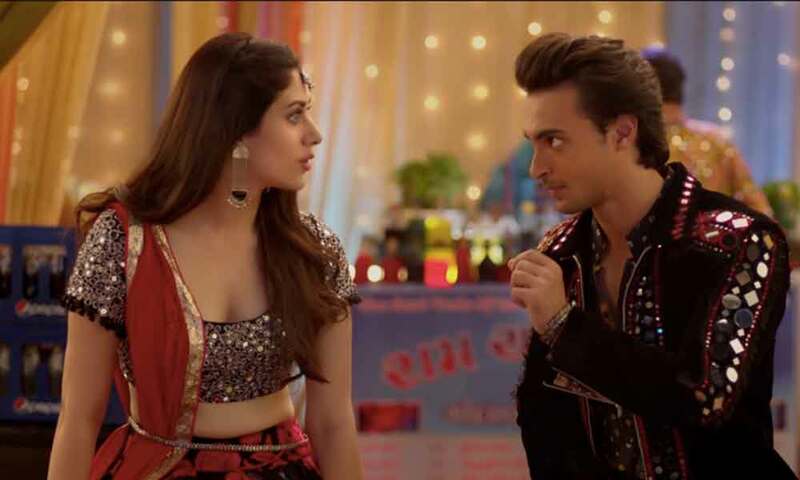 Music composer Tanishk Bagchi crooned the romantic track Tera Hua live for the audience while Aayush Sharma entertained the audience with a live dance performance on Rangtaari. The most loved act of the event was, however, the unplugged version of Chogada sung by Darshan Raval which garnered immense appreciation from the masses. The musical performances were followed by a light-hearted interaction between Salman Khan, Aayush Sharma, Warina Hussain, and Ronit Roy along with the audience and fans, where the masses indulged in a fun chat with the team. The music of LoveYatri has taken over the audience making the chartbusters a hit amongst the masses already. ‘Chogada’ turned into an instant chartbuster getting the nation grooving to its beats. ‘Akh Lad Jaave’ further added to the excitement of the audience with the sizzling chemistry of the leading duo. The third song ‘Tera Hua’ is a soulful melody sung by Atif Aslam which gives glimpses into the romantic liaison between the debutant duo. After the three chartbusters, the makers released yet another festive number Rangtaari and the recently released Garba track Dholida. Owing to the incredible response to the music of the film, producer Salman Khan decided to organize a live concert which garnered an exceptional response from the audience. The successful music album has added to the excitement of the film which marks the debut of Aayush Sharma and Warina Hussain. The trailer had earlier set the mood right with the foot-tapping music while tracing the journey of Love. Written by Niren Bhatt, ‘ LoveYatri: Journey of Love’ is directed by Abhiraj Minawala who will also be making his directorial debut with the film. The romantic drama will mark the 5th venture of Salman Khan Films. Next articleIndia’s New Kissing Sensation Jaey Gajera Is Emraan Hashmi Part Duos!